J&C Garage doors specialize in all kinds of garage door repair in Westchester County New York. Whether it is a residential garage door repair, or commercial garage door services, we are the solution. Our experienced technicians can fix every garage door from any garage door maker and model. Whether it is an opener problem, a broken spring, or if the garage door is off tracks, we are here for you, ready to add one more person to our long list of satisfied customers. We know that many times, it seem like the door picked the wrong timing to stop working, but there is no need to panic, we offer same day garage door repair in Westchester NY and the area. Whether it is a broken garage door spring repair, or out of track garage door, we can fix it. We believe that fixing the problem, does not mean that you have completed the job. The way we see the repair service, if you did not understand, solved and repaired the reason that lead to the problem, you did not provide a high quality repair service. We want to know that when we complete the repair, we know that we left a satisfied customer with a perfectly working garage door. A garage door maintenance is not a complicated job, as long as it is being done by a professional garage door repairman. The maintenance and the tune up should be performed at least twice a year, and by providing your door with a maintenance, you will receive a garage door that will work better and smoother, and a door that will continue to work and that will serve you for many more years. Many people tend to ignore the need for garage door tune up, and mistakenly think “why should we repaired something which isn’t broken”? But just like you wouldn’t think to ignore the need of your car for the yearly tune up and oil change, so you shouldn’t ignore the need of your garage door for tune up and lubrication. It can be a broken garage door in White Plains, or garage door repairs Bronx, the door must be lubricated twice a year. If there are broken parts, you must repair or replace them first, and only then perform the maintenance. Beside the tune up, the maintenance is a chance to check the door and the parts, and to make sure that there are no broken or damaged parts, and that the door is safe to use. Every garage door repair job that we take, include a maintenance service. We will never leave a customer with a garage door that does not work in perfect way, like every garage door should. A good maintenance service, include spring and opener adjustment, lubricating the garage door parts, and inspecting the garage door for broken or damaged parts, and if we will locate broken parts, we will replace them to make sure the door is working in a perfect way. Maintenance is not a replacement for repairs! If your door is broken, it must repaired first. If there are broken parts, like broken torsion spring, snap cable or a broken roller, lubrication the door will not help. You need to fix the door first. As we said, every overhead garage door in Westchester County need to be maintained every 6 months. And if you have been ignoring the need of your garage door for lubrication, and now the door is stuck, out of tracks, or need repairs, and you do not want to try and repair the broken garage door by do it yourself, you need to contact garage door technician in Westchester County to come and fix the door, and only then to lubricate the door. One of the most dangerous problems, that we deal with almost every day while servicing garage doors in Westchester County is out of tracks garage door. Whether it is a garage door repair in White Plains, commercial garage door in Rye Brook, or broken garage door in Nyack New York. If you will look at your garage door, you will find that what holding and connecting the door to the tracks are the rollers. When the roller comes out of the track, the door cannot, and shouldn’t be operated, until a garage door expert will put it back on the tracks. You may consider pushing the roller or the rollers back into the tracks, and not using a qualified garage door technician in Westchester County to do the repair, but that will be a mistake, since when garage door in Westchester is out of tracks, there is a reason for that, and the reason should be taken care of before the door can be used again. If you will not address the issue, the door can come out of tracks again, and the next time can be even more dangerous, since the overhead door can fall completely out of the tracks. 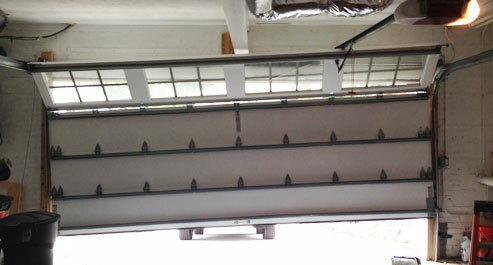 If your overhead garage door came off tracks, call a garage door specialist in Westchester to come and fix it for you. Do not assume that simply pushing the rollers back into the tracks will solve the problem. It is much more complicated than it may seem. Bringing the door back into the tracks is just part of the repair, locating the reason and the cause for the problem is another part of the repair, and should never be ignored. And this can be done by a qualified garage door technician, who knows overhead garage doors in Westchester County. Broken garage door spring is a common problem, and every spring that is being used for a garage door operation will eventually break. Luckily, a broken spring doesn't mean that it is time to replace the garage door with a new door, it only mean that it is time to call a garage door contractor in Westchester New York, to come and inspect the garage door. From broken torsion spring repair, to extension spring replacement, no matter what the problem is, we can fix it. We have the knowledge, and the experience, to match the right spring for your Overhead door, and we know how to replace the spring, without making a bigger damage, since using the wrong spring for the garage door, or using a spring that haven’t been correctly adjust can be dangerous and can cause a bigger damage to the door and to the opener. Which spring is the right for my door? Not every spring fit every garage door. There are many parameters that are being calculated, when matching the right springs for the garage door. It is even possible that if you will purchase the same size of spring like the one that snapped, it won’t necessarily fit your door. If you own an overhead door in Westchester County, that move with the assistance of extension springs system, it is recommended to install safety cables. Every garage door need its own set of springs! To you, different springs may look the same, and you may think that it is not a big deal if you will use spring which are too small or too big for your door. But the truth is that using the wrong springs for your garage door, whether it is a garage door in Scarsdale, or garage door repairs in New Rochelle, is dangerous, and can be dangerous, and also will prevent your garage door from working properly. The safety cables have no part in operating the garage door, and it will work the same with or without them, but in case one of the springs will snap, the safety cables will protect you, or other people or objects who located near the door. This is the place to warn you, that a broken garage door spring can be dangerous, and a garage door with a broken spring should never be used! A broken garage door, no matter if it is a broken spring or operator, can be dangerous, and shouldn't be used, before being inspected and repaired by a professional garage door contractor. For same day broken spring repair in Westchester County, please contact J&C Garage Doors, and get your garage door fixed today! If you own an automated Overhead garage door in Westchester County, that open and close by an electric opener, there are few things you should know: Many people don’t know that, but the force that actually lift the garage door are the springs, and not the opener. So if one of the springs snap, the opener need to replace the broken spring in opening the door, something that the opener is not suppose to do. This goes for every garage door, whether it is commercial overhead door in Westchester County, or broken garage opener in Rockland County New York. Many times, it may seem to the unprofessional eye, like the opener can’t lift the door because there is something wrong with the opener itself, but when we arrive to inspect the Overhead door, we find that the opener is fine, and what prevent it from working smoothly is a problem with the garage door mechanism. If you choose to ignore the problem, and continue to operate the door with the electric unit, beside putting yourself in risk, it will eventually lead to overheating of the opener and it will stop working and will need to be replaced as well. There is a reason why we chose Liftmaster to be our preferred garage door brand. When you fix garage doors in Westchester County for so many years, you learn which the strongest garage door openers in Westchester County are. Liftmaster garage opener repairs is something that we at J&C Garage Doors and Gates specialize at, and we install new Liftmaster garage openers almost on a daily base, while servicing overhead doors in Westchester county. It is no secret that quality cost more, but at the end worth the investment. So if you are considering to install new garage opener in Westchester county, you may want to consider invest in high quality garage opener like Liftmaster, and in return get an opener that will rarely need repairs, and an opener the will work for 20-30 years, as every Liftmaster opener we installed in Westchester will and still working. You can choose a belt drive Liftmaster opener, or even WIFI Liftmaster garage opener, whatever your decision will be, stick to quality, and enjoy a perfectly operating garage door with a strong opener. Sometime the opener can be repaired, and sometime you will have to remove the old garage opener and install a new opener. Whether it is Liftmaster garage opener, or Genie opener, J&C Garage Doors and Gates of Westchester County can repair it for you, or replace it in case there is nothing can be done. If your garage opener doesn’t include safety sensors, we will not be able to service it. The federal law require from every automated garage door that operate with electric opener to include safety sensors. If you own a garage opener that doesn’t include safety sensors, it may too old, and probably was installed before the law required from garage door contractors to install safety sensors. If that is the case, call a local garage door company in Westchester County to come and install safety sensors for you. We agree that there are some repairs, such as maintenance and basic repairs that can be performed in the “do it yourself way”. But, and here comes the important part, there are repairs, such a spring replacement, out of track repair and opener installation that better to be left for a trained garage door technician. Do you fully understand the problem? It may seem to you that the problem is due to the garage door opener that stopped working, when it is actually a broken spring or a broken pulley. Make sure that you know exactly what the problem is. If you are not sure what caused the door to stop working, don't even consider repair garage door by do it yourself, and contact a local garage door company in Westchester County New York. Do you have the right part? If one of the springs, or even both snapped, you will need to purchase a new spring. But even if you will able to find and locate the same spring like you used to have, that doesn’t mean that it is going to fit your door. If you are not sure what part to use, contact a local garage door contractor in Westchester County. Do you have the right tools? A garage door repair require certain tools. Using the wrong tool, or trying to improvise can be dangerous, and may put you in risk. Do you fully understand the mechanism of the garage door? If you are not sure for 100% that you know what you are doing, again, it can be dangerous. Do you own the exact same Overhead door? It may look simple on youtube, when you are sitting comfortably in front of your computer, but in real life things can go wrong, and you garage door is probably different from the one you saw on the Video. There are many garage door repairs Videos on Youtube, that teach how to fix broken garage doors. The thing with the Videos is that they are from the specific doors presented on the Videos, and not for your garage door, which is installed in your garage. And what may work for a garage door repairs La Puente CA, may not work for garage door repair in Westchester County New York. Do you know how to prevent the problem from happening again? Sometime the problem is due to lack of maintenance, but sometime there may be other reasons that lead to the problem, and if you will not repair them as well, the problem will happen again (Using the wrong spring for example).And just like many other garage door repairs in Westchester County, what may seem to you like the problem, may turn to be something completely different. Like when we receive calls from customers telling us that their garage door opener broke, and when we arrive we discover that the problem is actually a broken spring or a cable that snapped. So make sure you located the problem, or the problems, and fixed it. If you need a garage door repair service in Westchester County New York, we can help. We offer same day garage door repair, and we carry in our tracks all the parts that we need to repair your garage door on the spot. So let the professionals deal with the problem, and get your garage door back on track again, and even more important, we will make sure that it is safe for use again. 24-7 Repair service in Westchester New York. Garage door spring repair Westchester County. Garage door safety sensors repair Westchester County. Out of track garage door repair Westchester County. Westchester County garage door opener repair. Commercial Overhead door repair Westchester County. Garage Door Maintenance Westchester County.